The 6-foot-11 sophomore is clearly one of the best talents in the college game, and whether he goes as a lottery pick in the NBA Draft or a bit later in the first round this June, he has a very bright future playing the game around which much of his life has been centered, and becoming very rich in the process. That’s what’s coming for him. But right now and for as long as the Arkansas Razorbacks’ season goes, he’s living life as a marked man of sorts. He is the first if not the primary concern of every team the Hogs play. As head coach Mike Anderson often says, he is No. 1 on every opponent’s scouting list. Every team has to have a plan on offense and defense on how to stop and if not stop neutralize Gafford. That’s how problematic he is for every team the Razorbacks play. A few teams have had the guts to play him straight up. A very good LSU squad — one good enough to scalp the Kentucky Wildcats, 73-71, at Rupp Arena Tuesday night — did that and outlasted the Hogs, 94-88 in overtime. With a bit of a different approach, the Tigers, however, were outhustled by Arkansas at Baton Rouge, and the Razorbacks escaped, 90-89, with their best victory of the year. For the most part this season, Gafford has played outstanding to great against just about everything that’s been thrown against him. He’s averaging 16.9 points, 8.7 rebounds, 1.9 blocks in 28.7 minutes of playing time per game. By any accounting, that’s some efficient basketball. He may flop a little too often for some’s taste, but no one can legitimately say Gafford isn’t laying it on the line for Arkansas night in and night out in a league that is distinctly strong at the top and still dangerous 12 teams deep. 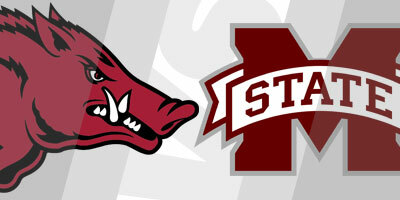 Oddly, though, the Razorbacks have found themselves in a quandary in their last two games. The Hogs lost last Saturday, 77-65 to South Carolina, on rare day when Gafford was roughed up by a very physical Gamecocks squad, featuring center/forward Chris Silva. Gafford scored just 8 points and had just 5 points. In that one game, the Razorbacks worked more efficiently when Gafford was strapped to the bench with fouls than when he was in the game. Silva and his support had Gafford’s number. Tuesday night Gafford bounced back against Missouri, scoring 26 points and grabbing eight rebounds, but the Tigers held off the Hogs’ comeback attempt, nipping Arkansas, 79-78. 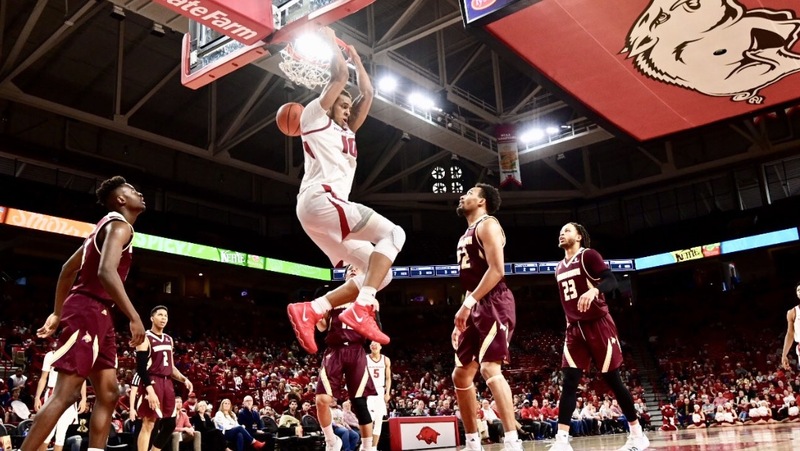 Even thought Isaiah Joe splashed in 17 points and became the most prolific freshman three-point shooter in Arkansas history, and fellow wing Mason Jones added a dozen points of his own, the Razorbacks appeared lost offensively in the first half when the ball wasn’t in Gafford’s hands. Defensively, the Razorbacks pressure didn’t bother the Tigers, which had just 11 turnovers. The Razorbacks, which rely on forcing turnovers to generate possessions, actually has 12 of their own giving Missouri at +1 in a crucial category for the Hogs. Despite ineffective defense by Arkansas, Gafford kept the Razorbacks within striking difference in the first half, scoring 16 of the Hogs’ 36 points. The Tigers’ 10 point lead (46-36) didn’t seem insurmountable at the half. The Razorbacks did make their run and had a chance to win the game on the final possession, but Hog point guard dribbled too much and failed to facilitate any shot much less a good one in the game’s final seconds. A week ago, the Razorbacks were riding a four-game SEC winning streak, a game above .500 in the SEC, but now the Razorbacks (14-10, 5-6 SEC) are on a two-game skid that could very easily slide into a four-game losing streak if the Razorbacks don’t play better on defense and more consistently on offense. A very physical Mississippi State squad (17-7, 5-6) rolls into Walton Arena at 7:30 p.m. Saturday, coming off an impressive, 81-62, victory over Alabama at Starkville, Miss., on Tuesday. Then the Hogs head down to Auburn (17-7, 5-5) on Feb. 20 to face a Tigers squad who loves to run, spread the floor and shoot the three. If you want to do a little scouting, Auburn plays host to Ole Miss (16-4, 6-4 SEC) at 7:30 tonight. on the SEC Network. Arkansas will have to play better than they have over the last week to have a chance in either game. The Razorbacks need more from Gafford’s supporting cast if the Hogs are going to have a shot at dancing during March Madness. The window of opportunity for the Hogs to win enough games to be in the postseason is closing, and if the Hogs don’t find some consistency, it’s going to slate on their fingers. While I wouldn’t label the Razorbacks a truly seasoned team, the excuse of them being inexperienced no longer flies 11 games into the conference schedule. The way the Razorbacks have played this season, they are a mediocre team playing is a good but not great league. The Razorbacks have the ability and opportunity to change the assessment positively or negatively in their final seven games of the regular season. The Razorbacks need to finish .500 in the league to be in striking distance of earning an NCAA bid going into the Southeastern Conference Tournament. That may even be too little too late with so many team log jammed together. I don’t see this team having the depth, talent or fire power to win the tournament championships, but with the right draw and a little luck, two victories in Nashville might not be out of the question. But not matter how well Gafford plays the rest of the way, the Hogs are facing an uphill battle to make the postseason. Right now, the Hog’s fate depends more on how well the rest of the Razorbacks rally around Big Dan than how he actually performs.